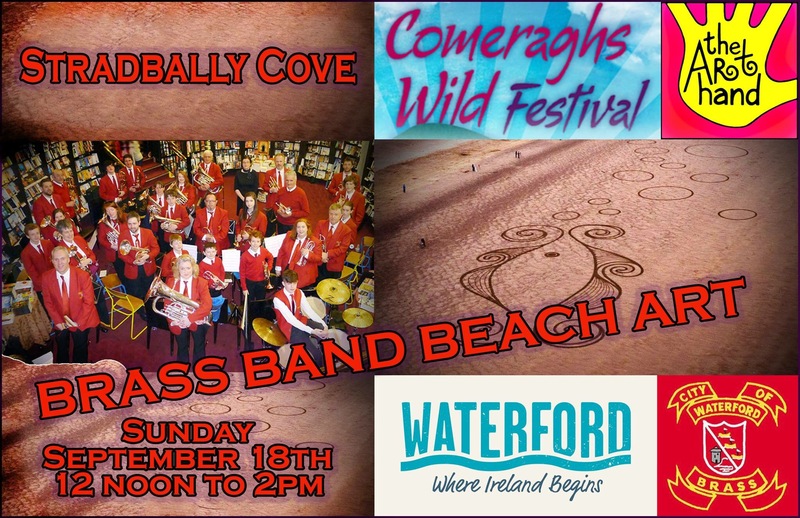 The Art Hand teams up with City Of Waterford Brass to bring you a performance with a difference on Stradbally Cove for the Comeraghs Wild Festival. This is an experimental collaboration that will involve Beach Art being made by a Marching Band! Members of the public are welcome to attend but please be aware that we intend to film the performance from a drone. So if this is happening (wind permitting) you will be asked to keep back at a safe distance. John Mernin from Waterford Brass had the following to say; We are always up for something new, whether it’s performing on water in Dunmore East or collaborating with Spraoi. We are looking forward to our next great adventure on Stradbally Cove. Please come along and enjoy the spectacle!Sean Corcoran from The Art Hand had the following to say; I’m super excited about this opportunity. I recently collaborated with a contemporary dancer on a sand art project in the UK so why not a brass band! I usually use a rake to draw massive pictures on beaches so I thought why not simply use the footprints of a marching band! The sand at Stradbally is very wet and soft under foot at low tide, so it’s ideal. This event takes place on Sunday, September 18th from 12 noon until 2pm. Stradbally Cove is located between the town of Dungarvan (16 minute drive) and the village of Bunmahon (13 minute drive). This entry was posted in Beach Art, Brass Band, Stradbally Cove and tagged City of Waterford Brass, Collaborative Art, Comeraghs Wild Festival, environmental art, Event, Experimental Art, Festival, Ireland, Land Art, Sand art, Sean Corcoran, Stradbally Cove, The Copper Coast, waterford. Bookmark the permalink.